Comments: The original station house and cottages. Comments: Another postcard view of Pitsea from around 1905. Note the Pitsea Junction nameboard. On the 17th June 1852 the London Tilbury and Southend Extension Railway Act was passed, authorising the construction of a new section of line between Forest Gate and Southend via Tilbury. 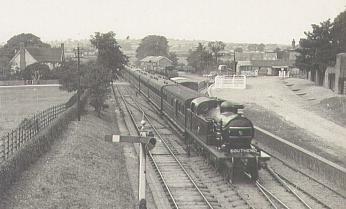 As the route passed through Pitsea a station was planned though the original site chosen was at Vange where the Fobbing crossing is today. In the event, this proved not to be, and after acquiring a small portion of land adjacent to Pitsea Hall, the station was finally built and opened on 1st July 1855. When the new 'direct route' to London opened on 1st June 1888 the station was slightly resited to accomodate the extra platforms. Space for the new line had been very restricted, and with a need to provide adequate banking against possible subsidence, an impressive series of brick built blind arches were constructed, which necessitated a speed restriction due to a tight curve. In recognition of Pitsea's new junction status the station nameboards displayed Pitsea Junction, though the station was never officially recognised as such in timetables or official documentation. From 1932 to 1953 the station was named Pitsea for Vange and following this a reversion back to Pitsea, which it remains today. The only other addition occurred during the 1950s and 1960s in recognition of the then station-less new town being developed the words 'ALIGHT HERE FOR BASILDON' were added to a separate nameboard hung below the Pitsea nameboard on at least two of the platforms. From the 1930s onwards local bus operator Campbell's provided a bus service from Pitsea Station to Gales Corner, Vange. Eastern National would later acquire Campbell's in 1956, and during the expansion of Basildon began service 244, which over time, would provide a direct service to Laindon Station via Whitmore Way, the town centre and Laindon Link. On Sunday 30th July 1961 an eight coach steam train being pulled by a 4MT 2-6-4 on its approach to Pitsea was in collision with a tipper truck on the Pitsea Hall Occupation level crossing. The truck driver, who was conveying spoil from new local developments taking place at the time, was killed in the accident. During the early 1970s the original Station House was demolished; the station cottages having been demolished some years earlier; and replaced with a single storey ticket office, which opened on 11th October 1971. This lasted until June 2004, and having been closed since 2000 due to structural defects was demolished and replaced with a new modern complex, which was officially unveiled in November 2005. Aside from the main station buildings a wharf also existed and it was here that the Campbell family first established a coal merchants business in the early 1890s. The family were originally from Ireland but settled in the area later establishing Campbell's Motor Services. Text researched and written by William Cox, 2003 with revisions 2004-2008,2011. Copyright © 2003-2008, B. Cox - Basildon History Online. All rights reserved.